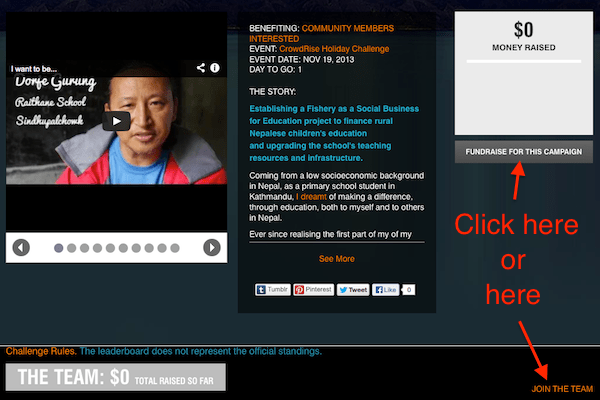 COMMITTED is taking part in the Crowdrise.com Holiday Challenge fundraising drive. The drive runs from November 18, 2013 through January 9, 2014. We are looking for individuals to join COMMITTED’s team to raise funds for us in your locality, from your family and friends, colleagues, students etc. You could even host a fundraising activity–a dinner, a bake sale or yard sale. Here’s how you join our fundraising team. Step 1. Go to our Crowdrise.com fundraising page by clicking here. Step 2. 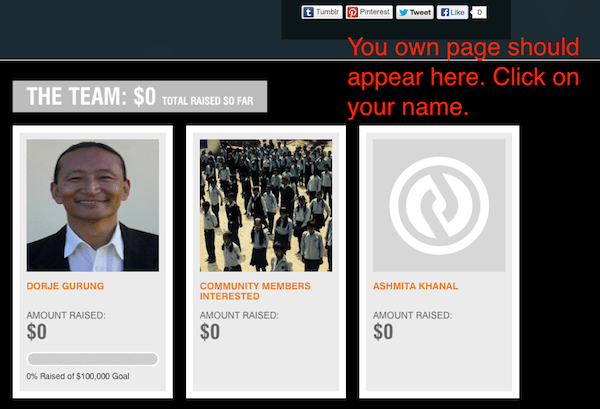 Scroll down a bit and click on the link FUNDRAISE FOR THIS CAMPAIGN or JOIN THE TEAM as shown below. Step 3. 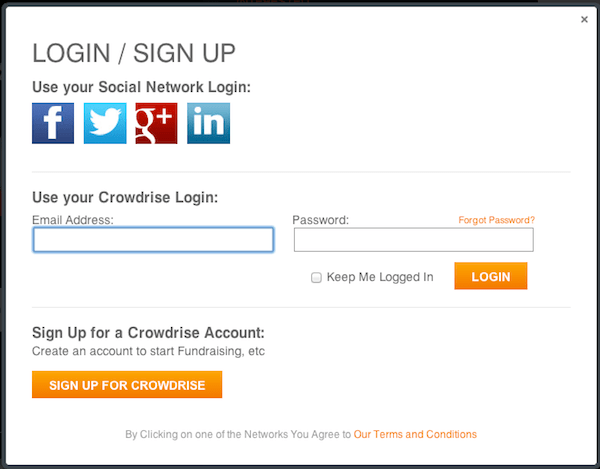 Sign up for a Crowdrise account using one of the four Social Network Logins or create one. Step 4. You’ll be taken to a page that looks something like the one shown below. Scroll down a bit and you’ll see something similar to that shown below. Click on the image of your page or on your name to edit the details on your page. Step 5. You’ll be taken to a page with the options shown below. You will next edit your fundraiser page. Click on the “EDIT FUNDRAISER” button as indicated below. Step 6. 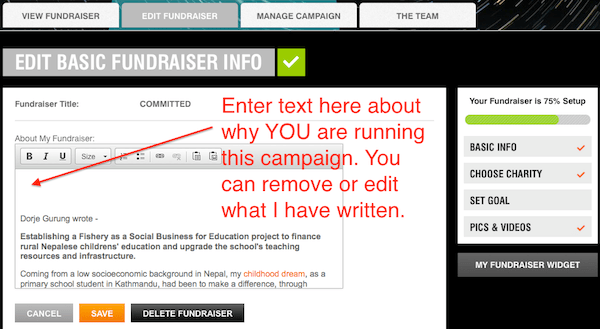 Next you’ll be presented with the option to “EDIT BASIC FUNDRAISER INFO.” Click on the edit link as shown below. Step 8. Next, you will set your own personal goal. 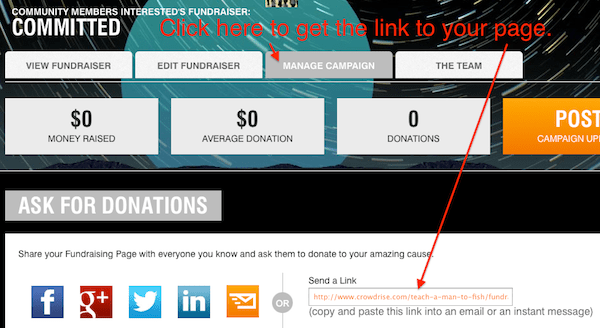 Scroll down a bit until you see ‘SET FUNDRAISING GOAL.’ Click ‘Edit’ as shown below. Enter a realistic amount and click SAVE. Step 9. Finally, share the campaign with your friends. There are two ways of doing that. Click on the MANAGE CAMPAIGN button and get the link to your page, as shown below, and share it with your friends on social networks. To share your campaign on your blog or website get the widget by following the instructions below. And copy and paste, on the relevant page, the code as indicated below.